School came pretty easy to me back in the day. I was lucky. I picked up on material quickly and was that person you hated who could memorize facts for a half an hour before any test and ace it. So when I decided that I wanted to learn French to keep up with my kids, I never questioned whether or not I would be able to do what I set out to do. Knowing myself and my schedule, I figured that the best way to go about this would be to teach myself using a highly structured program. Being a freelance writer, I create my own structure to get my work done, which is a challenge for somebody of my “artistic” nature. Some days my creativity and energy allow me to go beyond the achievement of my goals, but other days, it is a real battle to focus my attention on the work or on anything at all, other than the novel I’m reading or the pretty pictures and stories I find on the social networks to which I subscribe (Facebook, Twitter, Pinterest.) If I was going to get the French learning done, I needed to be walked through the process. I needed a preset program. 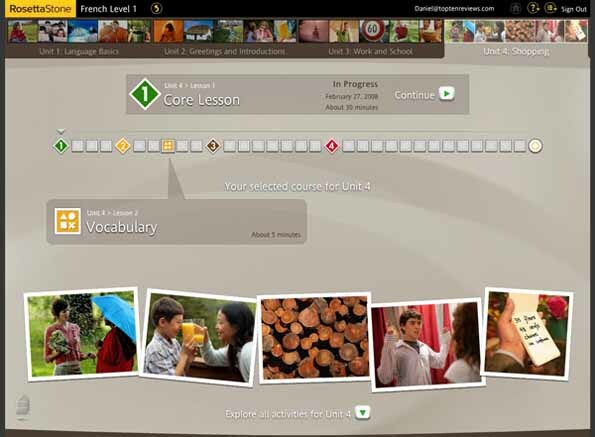 I chose Rosetta Stone, a pricy option but one that came highly recommended and focused on teaching the student how to speak the language rather than focusing on memorization and rote learning. I’m wise enough in my old age to know that education is best absorbed if you are required to use the knowledge, not just memorize it for a test. Regurgitating answers does not an education make. Of course, that is what I was good at during my early schooling years: memorization and rote learning. Not putting the learning into practice. I’d been working on the Rosetta Stone Lessons online for two weeks. I’d worked my way through the multiple lessons of Unit One. Men and women, boys and girls were eating and drinking and wearing hats and coats and dresses and pants. They were riding bicycles and swimming and reading books and newspapers. All in French. I was scoring in the 95% to 100% range on each of the lessons. Finally, the time came for my studio session. I’d spent the day before reviewing two hours worth of core Unit One lessons. Now all I had to do was use what I had learned. I set up my microphone and logged into the session. Elisabeth, the native speaker, said Bonjour to me and Kate and Peter. Then she dove right into asking questions of each of us. I was shaking I was so nervous. Both Kate and Peter responded to Elisabeth’s questions confidently (and with much better accents than I had). Now it was my turn. She asked me to describe what was happening in a picture, which was displayed on the screen. I paused. I wasn’t sure that I understood what she said (all in French) but kind of guessed it based on how the others had answered their questions. I timidly responded with one and two word answers. She said I was right and then repeated my answers in full sentences. Kate and Peter had known to use full sentences when they answered. In all honesty, I knew too but could only manage to get the basic answers out of my mouth. The entire session went like this. Kate and Peter responded quickly, fluently, in full sentences to Elisabeth and I pushed out one word responses that weren’t always the right answers. I knew the material when I saw it but when I heard it and had to think on my feet and speak the language, I froze. I couldn’t access any of the material I’d learned so well in my lessons. If she’d given us a written test, I would’ve done very well. Instead, I was so flustered that it seemed like I hadn’t really focused on the lessons as well as an ideal student (like Kate and Peter) would do. I felt something I don’t feel often, especially when it comes to academics. I felt vulnerable and out of control. I felt like the remedial student in the class. I WAS the remedial student in the class. But I made it through. And now I think I’d better take advantage of the speaking games that come with the Rosetta Stone package. And sign up for more studio sessions. I think I can take two a week. My stomach is fluttering at the thought. But I can’t stop now. I still want to be able to speak the language. Even if it means humiliating myself week after week until I finally begin to understand. Even if it means admitting to myself that I need to step out, for an hour or two each week, of the comfy, little, “I’m the smart girl” box that I have lived in for most of my life. Notions of self are based on past experiences; the present reality often forces you to readjust your thinking about who you are. Have you been in situations, like mine with the French class, where it became abundantly clear that your vision of who you are doesn’t exactly mesh with your reality? Go Sara! This is inspiring, in a weird way. I guess when we think of being brave, and showing courage, we don’t usually mean testing our limits THIS way. But that is indeed what you are doing, and I think you are very brave. I am going to learn Italian because you have inspired me! Yay Cheryl! Why is it that when I inspire it’s in a weird way? I’m okay with it but wonder about it. Are you planning a trip to Italy some time soon? Or is it simply that you want to know the language? We are going to Italy in April. With the Colcords. I think I was Italian in a prior life (not sure if it was at the same time as I was Jewish) and I really would like to learn the language. When we went in 2003, one shopkeeper, when I greeted him in Italian, asked me if I was Italian! I was so excited! I did go online to research programs, and did the demo for Pimsleur. Si, signorina! I knew that. Can’t imagine why it slipped my mind (Colcords!). Good luck learning Italian. If you’re looking for a great tour guide in Rome, call me. I have the one for you. I’ve stayed away from Rosetta Stone simply because of the cost ~ but knowing that you converse with native speakers..well, that’s got my attention for sure. It’s great that you’re sticking to it and your confidence will grow each class ~ you’ll be talkin’ the pants off of her. wait! why am I sweating?? Ha! No need to sweat. I think it’ll be quite a while before I feel confident enough to suggest we actually try this. WELL! Sara! This is ME you are writing about! The person who can memorize, but falls down in the “application” part. And BRAVO for you! I am so impressed. Not only are you following a writing schedule but you are learning a language on the side! Yes, your self image is taking some stress right now, but I don’t think you are giving yourself enough credit. So I will give you credit for being an inspiration to Me. I’ve heard of this Rosetta Stone and I plan to take a look at it. Carry on. Even if you don’t learn to speak “like a native” you will know more than when you started. And your kids will feel great, because They can help You. I’ve always found the speaking much much much more diffiult than the written theory when it comes to learning languages. (I’ve learnt both French and Japanese in the past.) I hate speaking unless I know I’m going to get it right… which is stupid. Good luck with your mission! Stupid but typical. Why are we so caught up in doing it right the first time? Maybe that’s why writing a novel is so hard. We want it to come out complete, which you and I know never happens. The language course sounds amazing. And terrifying for all the reasons you wrote about. In fact, I think you were rooting around in my head and exposing my fears. I tried to learn as much Italian as I could before going to Italy last summer and was feeling pretty good about the basics: hello, goodbye, ordering in a restaurant, hailing a cab, etc. as well as being able to read a train schedule, street signs, and so forth. Definitely NOT a full-fledged speaker by any stretch, but enough to get around the country without embarrassing myself. Or so I thought. Here’s the thing I realized about learning a language: while I can memorize and regurgitate the words and phrases with relative ease, when I’m on the spot with a native speaker who is speaking gorgeous, perfect Italian, I’m suddenly paralyzed by my own ineptitude and less than perfect pronounciations. I falter, can’t think of what to say, and just stare at them, red-cheeked with embarrassment because I can’t remember the words and am not confident enough to fumble through it. What I learned while in Italy, though, was to keep trying. Keep speaking it, even if you get a word wrong or the pronounciation is off. Keep practicing because that’s how you build confidence and shake off the nervousness that stifles your learning. Here’s my cynical side….do you think Kate and Peter are real, or just avatars? Oh, my! Good for you for pursuing a difficult goal. Change management theory says that if you acknowledge that it will be hard, you may be more successful. Keep digging away. French is a beautiful language and you’ll enjoy being able to use it once you have it!